As the counter-cultural view expanded during the 60s, one of the divides between the status quo and those who supported new views was between athletes (who typically sided with the status quo) and, for lack of a better word, nerds. By nerd, here, I mean anyone whose views and preferences put them outside the views and preferences of those around them. 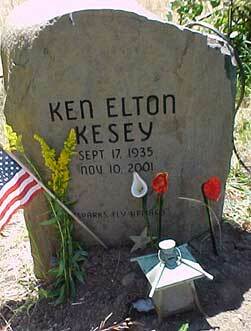 Ken Kesey was a bright and athletic person. Those two characteristics are often and unfairly viewed as opposites of each other. He was a great wrestler in college who won several awards as a wrestler. He’d even qualified for the Olympics, but an injury prevented his participation. At the University of Oregon, Kesey majored in speech and communication. He loved literature as well. His preference for Ray Bradbury’s science fiction expanded to include Ernest Hemingway and other modern fiction writers. After his graduation from Oregon, Kesey began a non-degree program in creative writing at Stanford University. He lived most of that time on Perry Lane, an enclave of cottages near the university and where many “outsiders” lived. Also living there was Ken Babbs and Larry McMurtry, two people who would play a huge part in Kesey’s future adventures. Though some faculty members saw Kesey as an emerging talent, others thought him a threat. A typical reaction by the status quo to a non-traditional view. Despite the intolerance, Kesey continued taking classes. Anyone who has taken graduate courses knows that finding a source of cash always hums in the background. 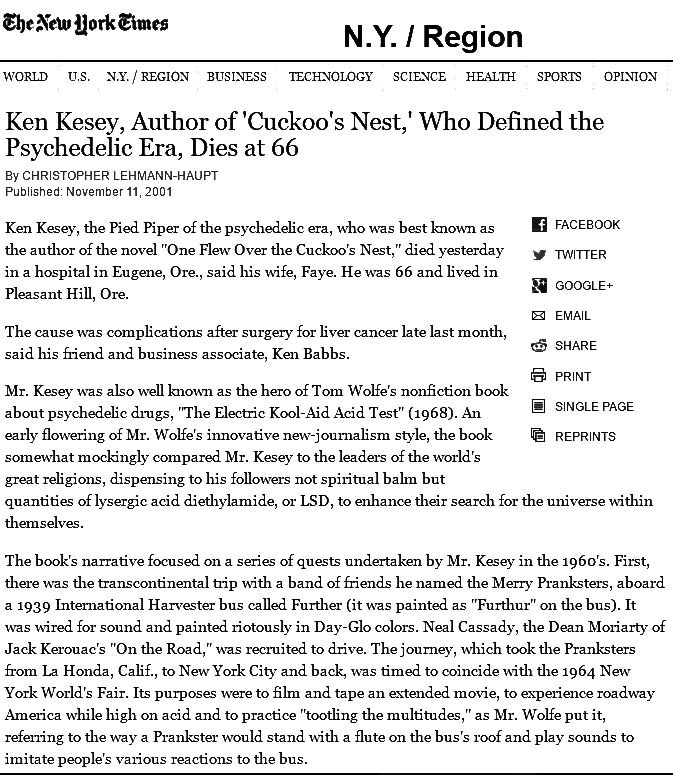 Ken Kesey began to volunteer in a drug testing program. It was the top-secret Project MKULTRA, a federal government program aimed at discovering and developing drugs to use in the Cold War. 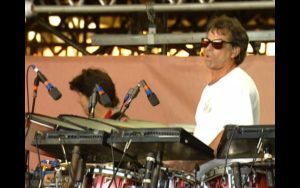 Psychoactive drugs such as LSK, mescaline, and psilocybin were part of the protocol. 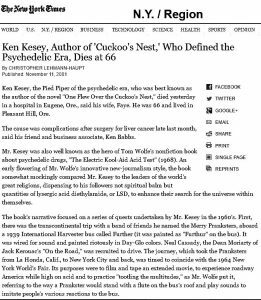 Kesey’s use of these drugs, his job at the Menlo Park Veteran’s Hospital, and creative ability led to his final draft of One Flew Over the Cuckoo’s Nest, the book that put Kesey’s name on the literary map. As anyone who has the wonderful tool of Spellcheck knows, our ability to spell correctly runs up against the English language’s failure to pronounce words as spelled. Roy Sebern learned that when he first spelled the bus’s name. The bus was a 1939 International Harvester school bus. Kesey had written a second book, Sometimes a Great Notion, and he decided to combine business with pleasure and travel cross-country to New York for the publication party. 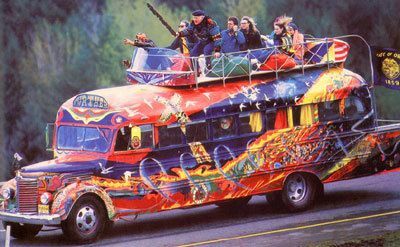 Kesey’s crew, known as the Merry Pranksters, fixed the bus with video and audio equipment. On the Road hero Neal Cassady was the driver. The story became part of Tom Wolfe’s famous Electric Kool-Aid Acid Test. 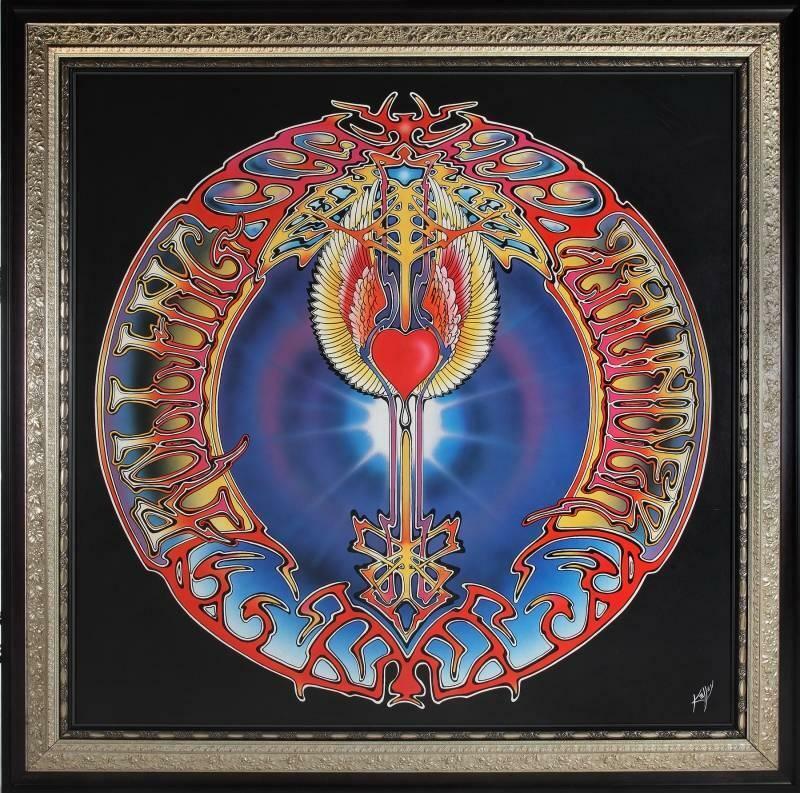 Not until 2011 were the disjointed audio and filmed pieces put together and released as the documentary Magic Trip. 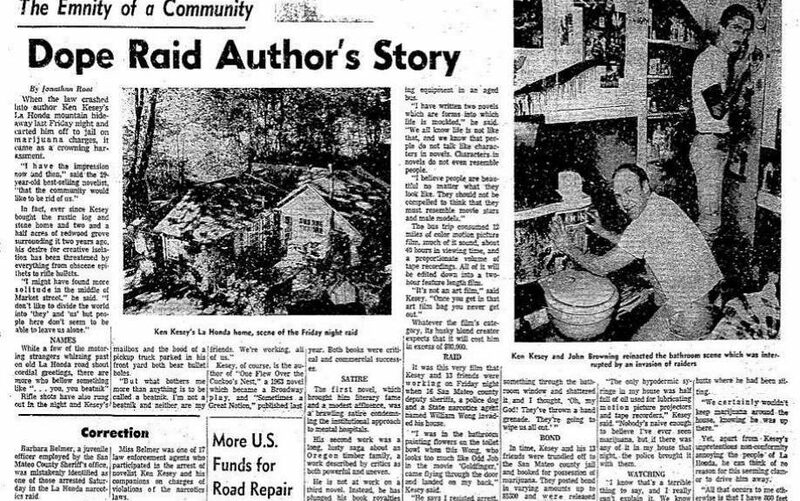 After the demolition of the Perry Lane cottages, Ken Kesey moved to La Honda. It was there that the so-called Acid Tests emanated. 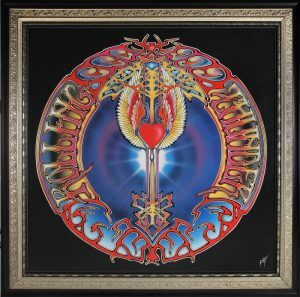 With LSD as the cocktail, black lights, strobe lights, fluorescent paint, video cameras, tape recorders, and the music of the Grateful Dead combined to make a grand experiment. Kesey gradually exited from the public eye. An Acid Test graduation, a marijuana conviction, a faked suicide, and escape to Mexico, his return to the US and arrest (NYT article), a 5-month imprisonment, and a return to Oregon where he became a family man raising children and writing. In 1992 doctors diagnosed Kesey with diabetes. He continued to be an active writer and activist, but mainly from his Oregon home.